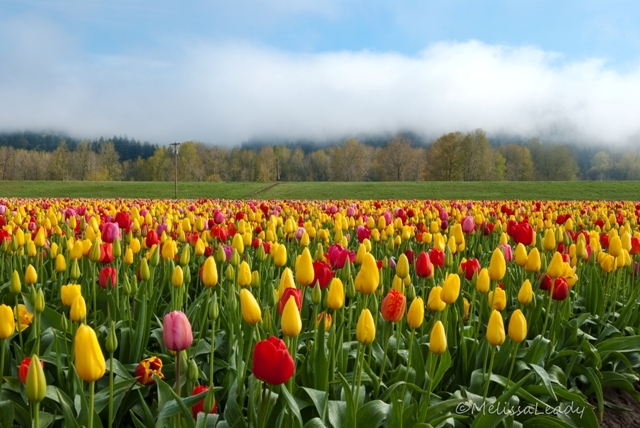 The tulip farm in Woodland is close to the Lewis River, and in fact once you exit I-5 you drive along the river to get to the farm. 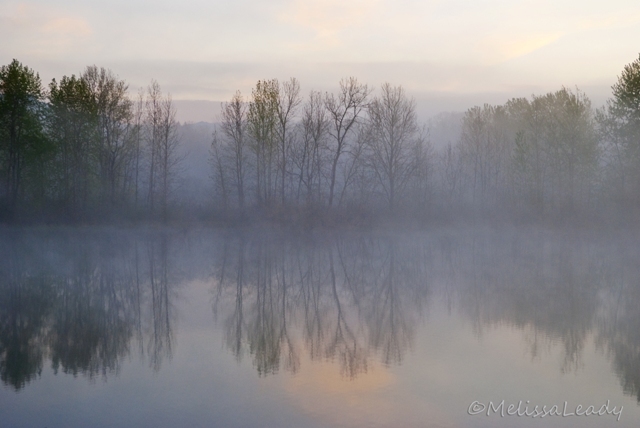 I had a few extra minutes before sunrise, so I made a short stop along the river's edge to photograph the river and trees in this soft layer of fog. The photo has a nice early spring feel with the young leaves just opening. We had a fabulous ground fog yesterday morning, so I thought I should head back to the tulip farm in Woodland to see if the fog was hanging there too. 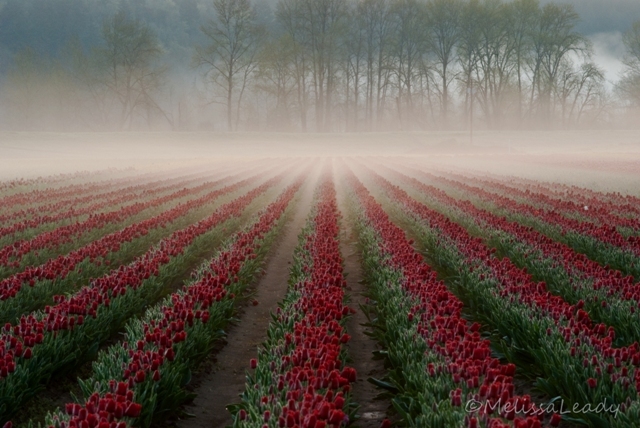 Turns out there was no fog in the tulip field, but as I drove past the large farm building looking to set my sites elsewhere I discover another large tulip field with plenty of red! And surprisingly, this field was shrouded in a thin layer of fog! This field was not open to the public, so I set up at the edge of the field and waited for sunrise. Too bad the sun rose directly in front of me so it turned out to be way too strong. This photo was taken several minutes before the sunrise. Fabulous cloud front illuminated by the setting sun earlier this week. And very typical of what we see in the spring: rain, sun, repeat (xn). 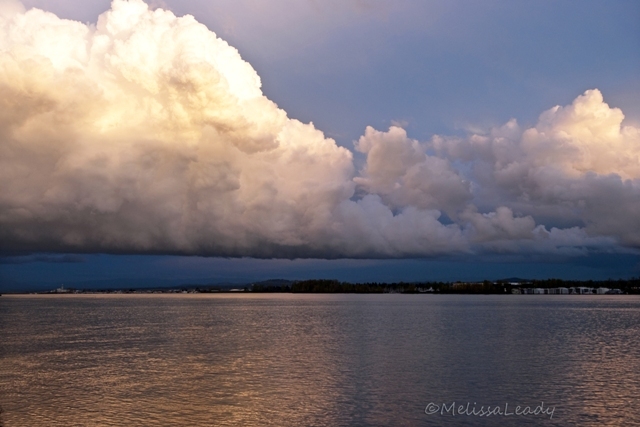 We were waiting for a table at a restaurant along the Columbia River, between Vancouver and Portland when this cloud and setting sun were forming. The scene sent me hurrying to my car to get my camera! Finally a break in this rain week we've been having! I took advantage and headed to Woodland to check out the tulip fields at the Holland American Bulb Farm, which is quite a bit smaller than the Wooden Shoe Farm in Woodburn, Oregon but is also a lot closer. It was pretty foggy this morning, but at least the fields were in full bloom. During my visit a tiny strip of blue sky opened up for a short time, and I capitalized. Technically it might not be a sunbreak, because the sun was still behind the fog. But it made for a bright photo without all the shadows cast by the sun, and I think the photo does a good job giving the illusion of a sunny day. There weren't any red fields to photograph, but at least I stuck to my goal, kept my zoom lens in the car and focused on the wider field view. 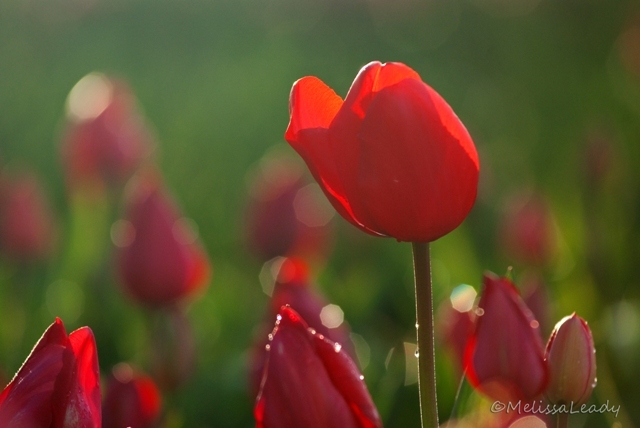 Another closeup from my early morning trip to the Wooden Shoe Tulip Farm in Woodburn, Oregon on Saturday. It seems like this backlit closeup was the only type of composition I had any success with. I need to be more disciplined on my next visit though, because I don't want a tulip closeup this year; I did that last year. This year I need a tulip field photo. And I do want red. So I got it half right at least. Note to self: Next time go right for the red tulips, and no zooming in! 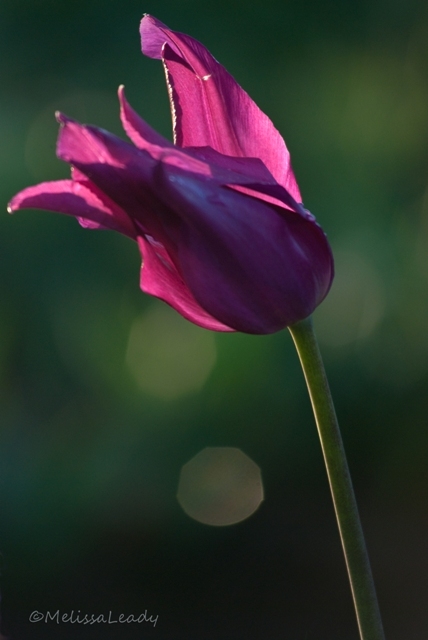 This fancy purple tulip was just opening up to greet the day at the tulip farm in Woodburn, Oregon this morning. I think peak bloom is at least a week away still. So I've got a colorful subject matter for the next few weeks; it's a welcome change for me from all the moss and rushing water I've been photographing recently. 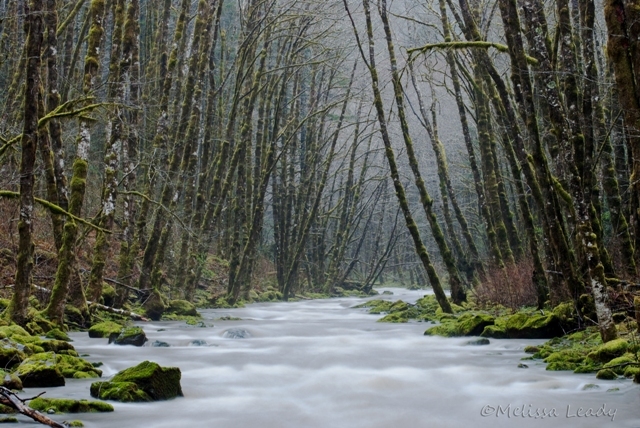 I headed back to the hike along Tanner Creek this week. In last week's photo the water was reflecting the golden hillside color, and I was curious if I could find the water reflecting a greener tone in the shade. As you can see, there isn't much color reflected on the water at all. I was disappointed with that, but it was a learning experience. I am still interested in finding that green reflection, so I've updated my theory. Now I'm wondering if I could get a green reflection on a sunny day in the summer when all the deciduous leaves shift the color balance to a darker green. Trees are just leafing out this week, so I will give it a month or so and try this shot one more time. 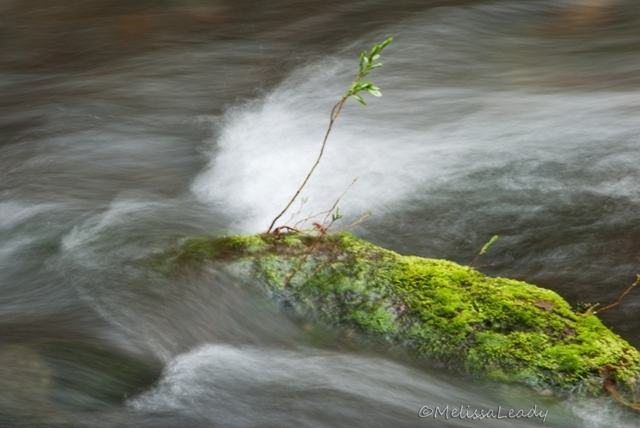 Our rainy weekend left the banks and river rocks along the Wilson River a vibrant shade of green. Early spring is such a green time of year, but I think the Pacific Northwest is extra green! The popular fishing spot along the Wilson River is actually the spot where two forks of the river meet. The fishermen told me they are the north and east forks, but just up the road the sign indicates Devil's Lake Fork Wilson River, so there are some local variations. I would have liked to photograph this confluence from a wider angle, but I just got my sensor cleaned last week, so I wasn't about to switch lenses in a heavy rain! Yesterday's and today's photos are both taken with my zoom lens, but today's scene is very close to where I was standing so it's a zoomed in view of the meeting of the rivers. Laminar flow meets turbulent flow. It's a great river merge, I think, with the two forks balanced in size and flow. 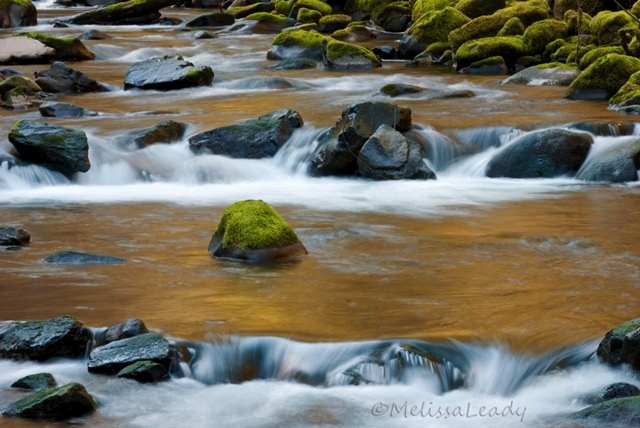 This bend in the Wilson River is a favorite stop for local fishermen. We spotted them casting along the bank on our drive back from Tillamook a few weeks ago. I photographed the river then, but wasn't happy with how my photos turned out, so this morning I decided to head back and try again. The early weather forecast was not entirely accurate though; I was counting on the rain easing up, but it was coming down pretty hard when I arrived. I keep a large umbrella, rain boots, etc. in the car, so I was prepared to hang out in the rain with the die hard fisherman (there were four this morning). 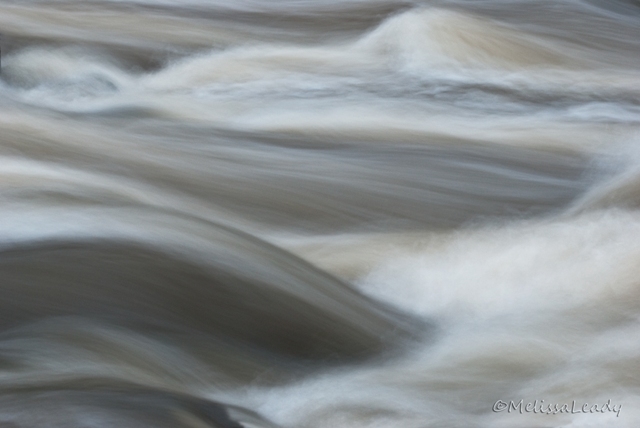 Today's photo is not what I was envisioning, but I do like the rain-swollen river. 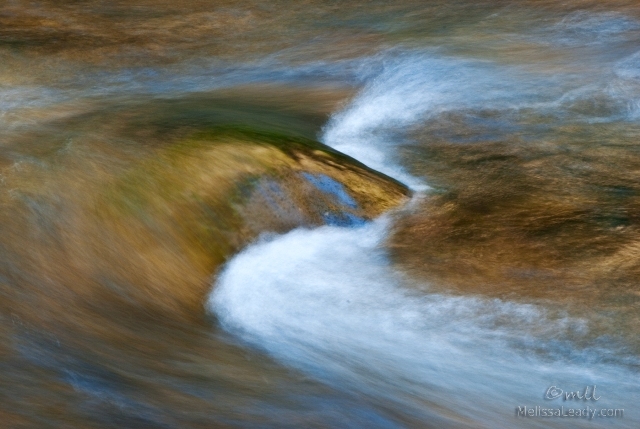 In my previous attempt there were lots of rocks visible throughout the river, so this one is simpler and more focused. 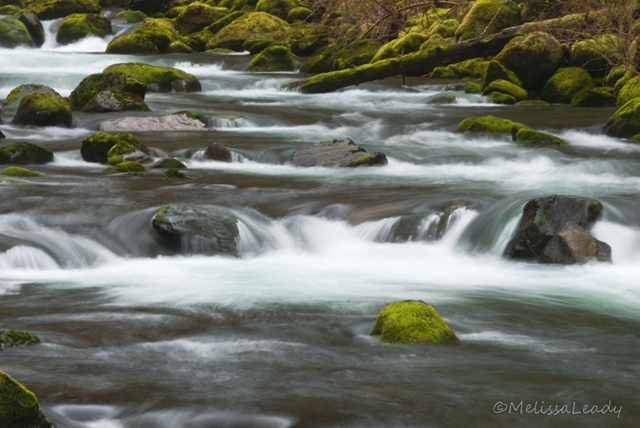 Another view from the hike along Tanner Creek toward Wahclella Falls. 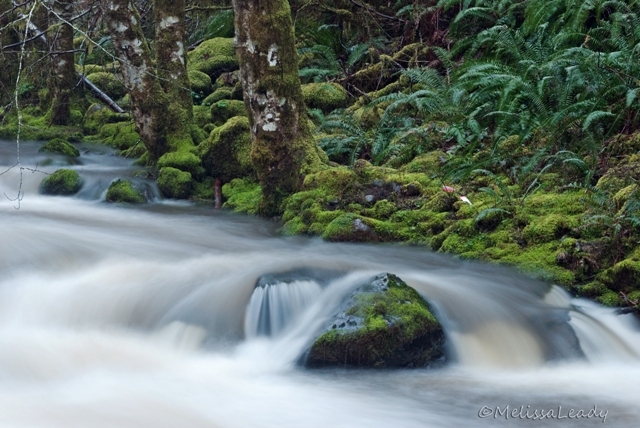 The creek and hike wind through a deep, mossy ravine, and I was imagining the water reflecting the green moss. But I hiked here on a very sunny day, and even though the river was deep in the shade, the steep, mossy hillside was in bright sunlight and was looking surprisingly yellow. I can't say I love this color combination much, but this is what nature provided. I'd be interested to head back to this hike on an overcast day to see how the reflection changes. 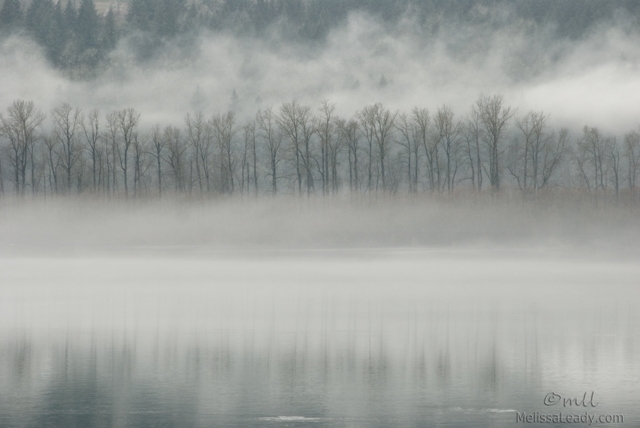 A soft layer of fog was hovering right on the surface of the Columbia when I headed through the gorge last week. I especially like the faint reflection on the still water. From my trip to Goldendale. Last week's black and white fence photo was also from Goldendale. 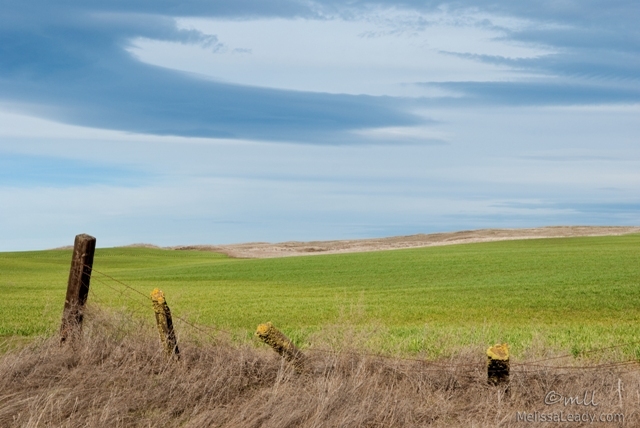 Some interesting lenticular cloud formations were developing during my afternoon in this corridor between the gorge and the eastern Washington plains. I really liked the cloud color in this particular scene, and also the fresh green grass and golden lichen. A very early spring color palette. The sun is directly behind me in this photo, which really flattens the scene, but that's OK because I was picturing this photo as a more abstract color-blocked scene anyway. 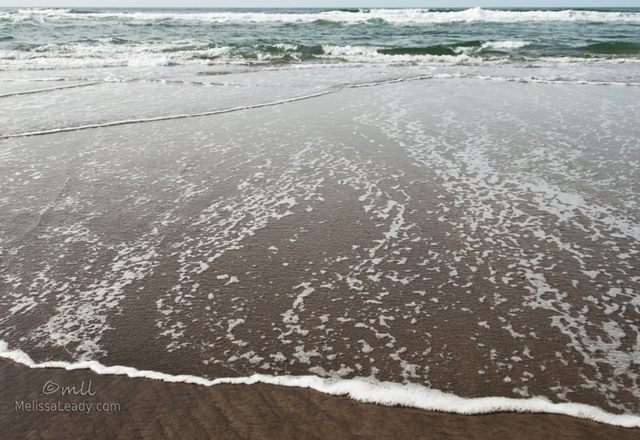 Tide was heading out during our visit to Rockaway Beach on Sunday. 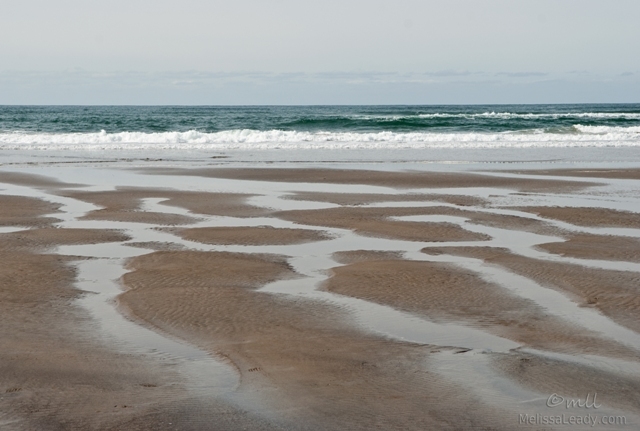 I love the tortoise shell formations that pool in the sand as the tide recedes at this beach. I need to plan a trip back here in slightly different weather, and at lower tide when the crevices are more clearly formed. If the weather holds, maybe we can come back for a visit in the next few weeks...it's such a relaxing getaway! We're having some beautiful sunny weather for this time of year, so yesterday we decided to take advantage of this with a trip to Rockaway Beach in Oregon. This is one of my favorite beaches because of the tide pool formations. 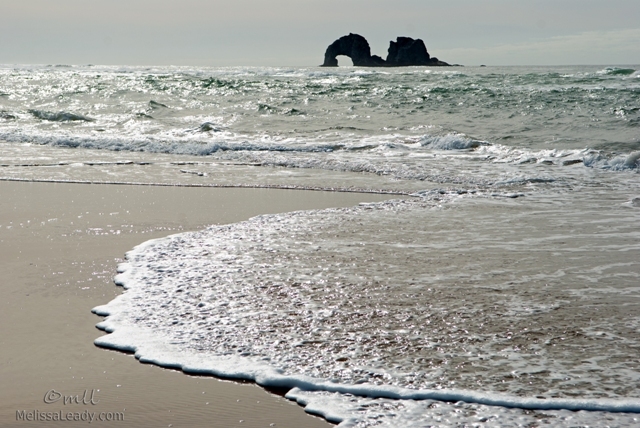 It's between Cannon Beach and Tillamook, which are both a lot easier to access, but sometimes I think it's worth the extra drive to get to Rockaway. I'll post a tide pool photo tomorrow, but I thought I would start today with the iconic "twin rocks" visible from Rockaway Beach. I'm not really sure why they call them twin rocks, since one has a big hole in it and the other doesn't. But they are definitely a pair, and a distinguishing feature of this beach.